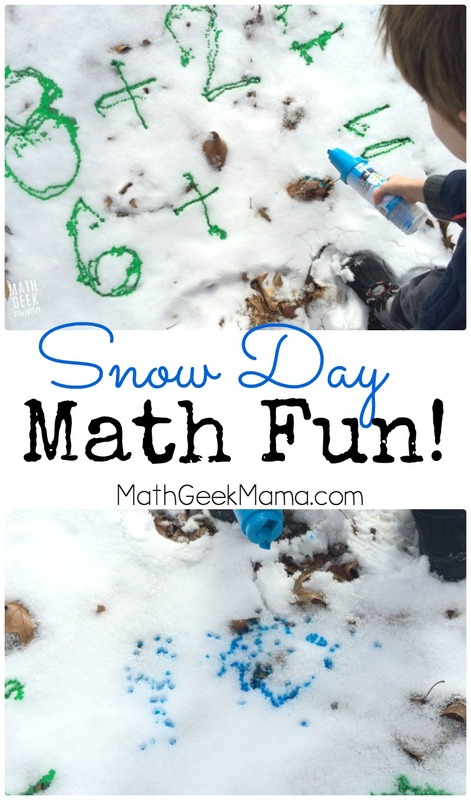 Math in the Snow: Snow Day Fun! I am really ready for spring. I’m ready for warm weather and t-shirts. I’m ready for my kids to spend the better part of the day playing and exploring outside. Unfortunately, we’ve had snow for the last week. And it’s still coming down. So instead of staying stuck inside, I decided to embrace the cold and take school outside! So last week I took my kids outside to do math in the snow. It was a nice change of pace, and a good excuse to get out of the house! I truly believe there are countless benefits to learning outside, and I was starting to get frustrated by being cooped up in the house. So rather than continue to moan, I found a way to get out and still learn. Obviously, my kids could still go outside even if they weren’t doing school work, but taking school outside was a fun way to keep them motivated and change things up. We actually went outside to do this so that we could get out and so I did not have to worry about the paint getting all over everything. If it’s a little too cold where you are to actually go outside, you could always bring some snow inside to work. My kids received these cool snow paints as a gift for Christmas. If you don’t have that though, there are lots of other options. You could mix food coloring with water and put it in a squeeze bottle, or you could use tempera paint powder like in this post. We had fun with the squirt bottles, and it was a good opportunity for my son to work on his fine motor skills. 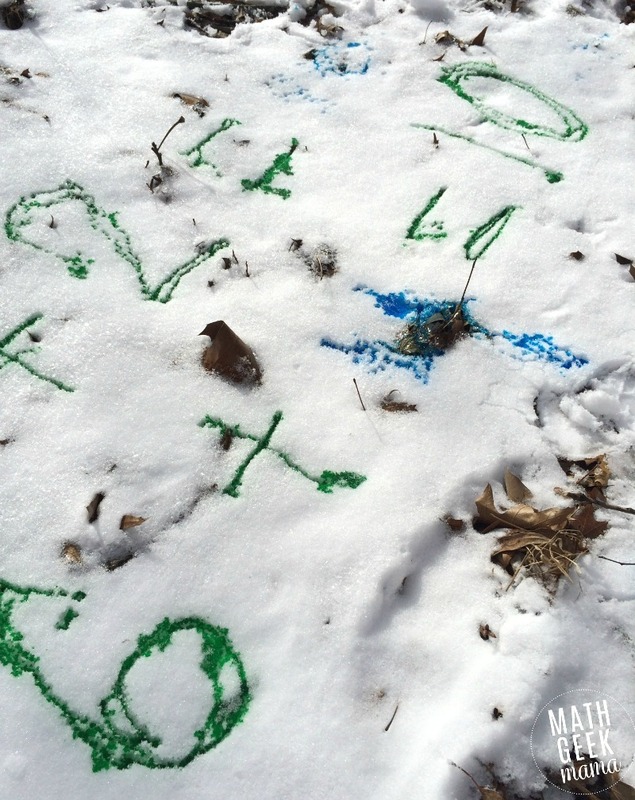 After I mixed up the paint, I took it outside and wrote some addition sentences in the snow. My son is focusing on making ten right now, so I wrote out a few different problems, some equal to ten, some with a number missing (i.e. 6 + __ = 10) to help him think about the number bonds of ten. Obviously you could write out any kind of math equation you like! Once I had some problems ready, I let him solve them by writing the answers with a different color snow paint! 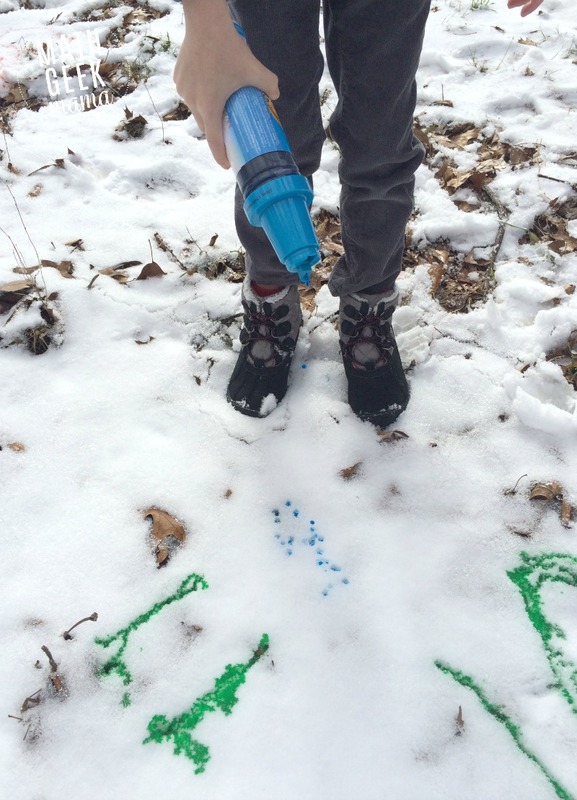 It took a little practice to get used to using the squirt bottle, and we found that to have more control it was necessary to be closer to the ground to write. 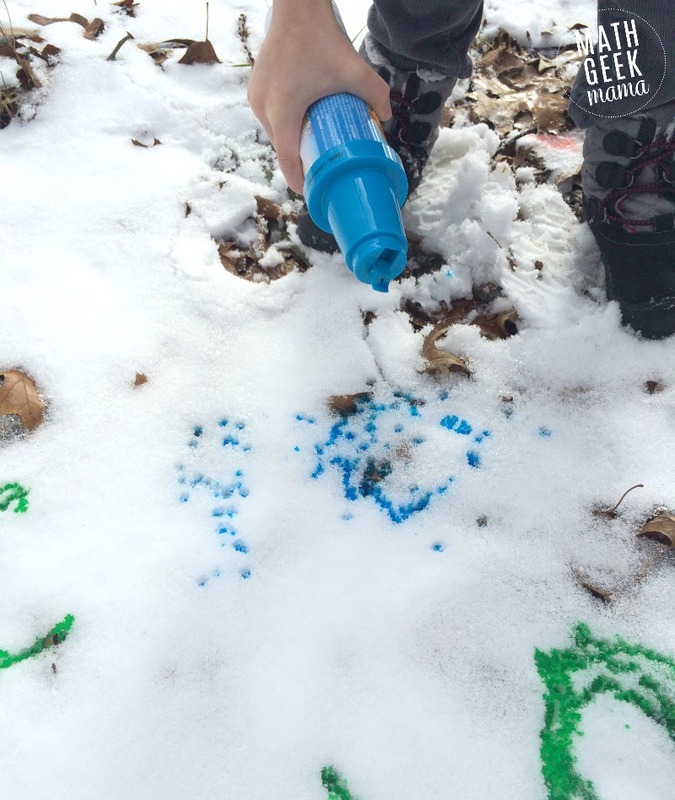 You could also draw game boards or ten frames in the snow and play math games! And like I said, once we were done with math, I let my kids play and create fun art projects in the snow. And now that we have a whole new layer of snow outside, it’s time to start again! 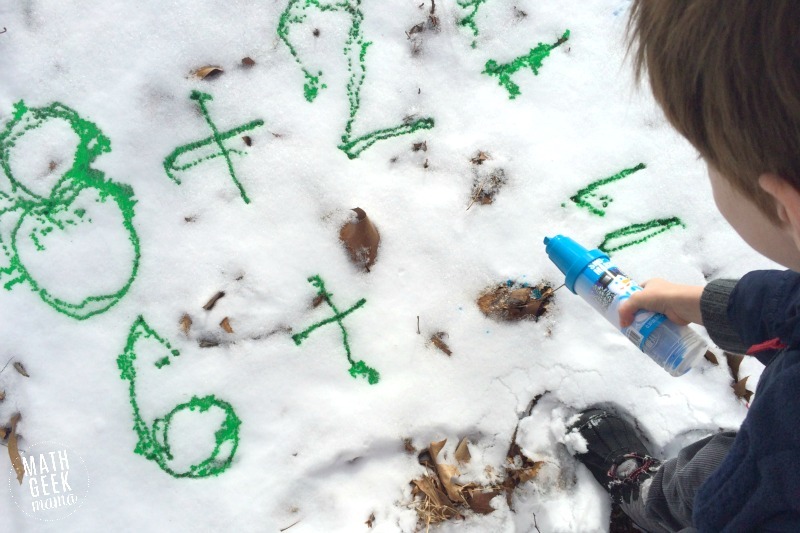 Have you ever tried snow painting or doing math in the snow? What tips would you share? Thank-you Bethany for “Get the Bird Home” game. We will enjoy playing this together!